As I write this there is some sunshine coming in through the window, much needed sunshine, light that we all long for this time of year. It’s so good to see blue sky again. Today I want to share a bright image, one that highlights the colors of this holiday season. These candy canes have been edited in Gimp, as I continue to play with post processing just to see what can be done. Lately my eye is drawn to abstract images which lead me to mess with this. I used a Map feature called “illusion” to get this affect. To the right is the original. Totally unrelated to candy canes…. Here is an article worth your time, but be prepared to shed a tear or two. I like how the author talks about giving someone permission to break our hearts. I like the effect you got with this. Yes, abstract, but not enough to offset the subject. The color(s) are so cheerful. Happy holidays Deborah. 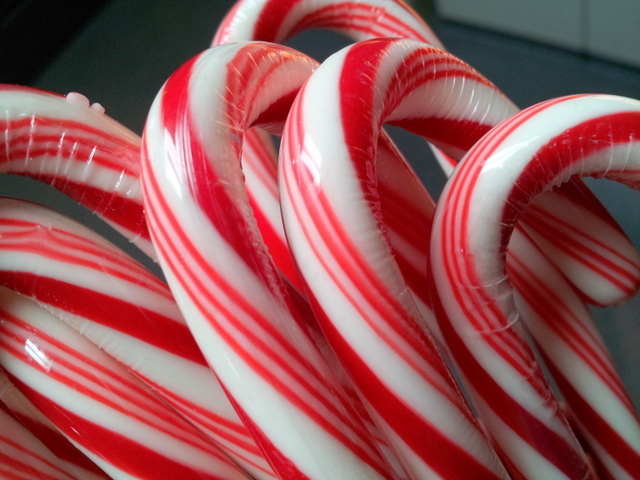 I like this festive pinwheel of candy canes. It seems like you are having a wonderful time with your post-processing experimentation. The possibilities are endless. Love this!! It reminds me of a kaleidoscope! Ahh a perfect little Christmas kaleidoscope of colors. Merry Christmas, Deborah. Many blessings to you and your family! !